TLV has supplied vortex flowmeters for steam flow measurement in a development and refurbishment programme at the Queen Elizabeth The Queen Mother Hospital in Margate, Kent. Each of the boilers was fitted with a high-performance vortex flowmeter from TLV Euro Engineering, together with a compact TLV flow computer to enable remote monitoring. By checking the additional meters located around the site they are able to decide whether they have a general problem or if they can pinpoint an isolated incident. 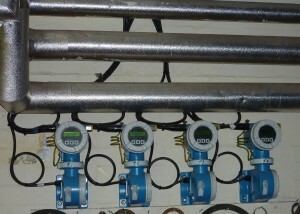 The Flowmeters also enable the production of cost allocation data. The TLV EF73 was chosen because it best suited the hospital's application and its specification offered an integrated computer with remote access. The EF73 has helped to identify a small gas leak in a boiler pilot valve by highlighting an unexplained increase in gas usage in the summer that wasn't attributable to an increase in water or steam. The TLV EF73 is a high-performance vortex flowmeter capable of providing accurate volume or mass-flow measurements of gases, liquids and saturated or super-saturated steam. It features an integrated computer to calculate mass flow from measured volume flow and temperature variables. The Queen Elizabeth The Queen Mother Hospital installation was also equipped with a TLV EC351 remotely operated flow computer, which combines signals from volumetric flow meters with those from pressure, temperature and density sensors. The EC351's flow equations use the hospital's data to calculate and display a range of variables that can be used for monitoring and diagnostic purposes. * The EF73 has been discontinued and replaced with the EF200. For more info on the EF200, click here.